Continuing with our 2013 graduating surgical resident class interview series, we spoke with In-Kyong “Inky” Kim, MD in unusual circumstances. 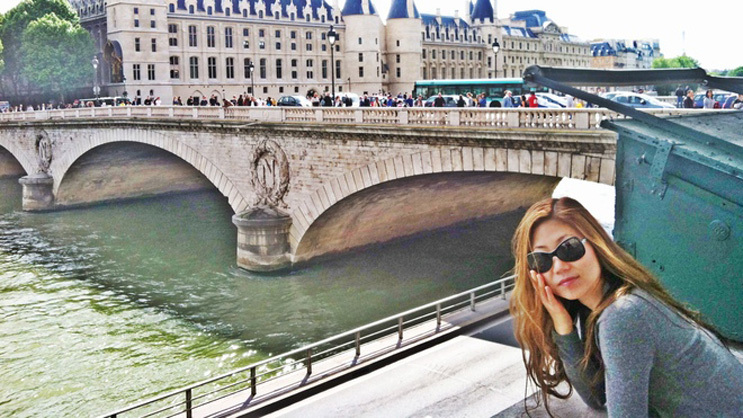 After recently getting married, Dr. Kim was flying off to Paris to celebrate her honeymoon. We caught her on the phone in the airport and she happily shared some insights into her time at NYP/Columbia. Q: What made you decide to come to Columbia? Dr. Kim: In 2007, I graduated from Mount Sinai School of Medicine and continued straight into my residency. When looking for a residency program, I had a few different criteria. I searched mostly in the New York area because one significant characteristic for me was a high operative volume, which can be difficult to find outside of the New York region. It was also important that I find an academic focused institution as well as an environment where I felt comfortable. After all, I was going to spend most of my hours over the next seven years at this institution. When I interviewed at NYP/Columbia, it filled my requirements – I was impressed with the facilities and operating load and immediately felt I had made a connection with the staff. Over all, I found Columbia was a good fit for me. Q: Having just completed your residency in general surgery, what are your career plans? What inspired your decision? Dr. Kim: I will be continuing onto a vascular surgery fellowship here at New York Presbyterian. This is a joint program, and I will divide my time between NYP/Columbia and NYP/Cornell. I originally became involved with vascular surgery in medical school when I participated in a vascular sub-internship and found it fascinating. When I started at Columbia, I was able to take advantage of its large vascular department and that solidified my interest. Five years down the road, I see myself at a large academic center. I would like to have an operative position as an attending with the ability to do clinical research as well. Q: What aspect of your time here as a resident will you miss? Dr. Kim: While I will be continuing some of my time here as a fellow, I will definitely miss the resident camaraderie. We have developed a close bond, going out together and socializing even outside of work. Many of the people dearest to me were also members of the Columbia program. In fact, my husband and my bride-man were two of the interns here with me. Q: What advice would you give to a new resident entering a residency program? Dr. Kim: Think about your ideal residency program and find one that fits you. The NYP/Columbia surgical residency program is not for everyone. I found a resident that thrives here is one who can take the bull by the horns and take the experience they want out of their residency. If you have this initiative, then this program can advance you and your career far. Q: How did you keep a balance between your work and life? Dr. Kim: It was very difficult. As residents, our personal lives did suffer, especially during the first few years. What helped was understanding my priorities. If work was my priority, then I needed to hit that head on. If I wanted to maintain a healthy personal life, however, then I needed to accept the fact that it was going to take away from my work life. It was hard to do both with my full attention, because each required a great amount of energy. My effort would be focused more towards my work or personal goals depending on the point in my life. Maintaining a balance meant recognizing where my priorities currently lay and accepting the fact I could not do everything. Q: Can you offer any examples of how you relaxed or distressed? Dr. Kim: I planned trips during the little free time I had. Planning a trip gave me something to look forward to, which could make all the difference. Two years ago, I planned a trip to Costa Rica and learned how to surf. This year, we’re discussing a snowboarding trip. Even for our honeymoon, I was looking forward to our one week in Paris – and we’re going there without a plan. We spend so much of our time planning and thinking ahead, sometimes it’s nice not to think about things so far in advance.